Colin Farrell stars as Doug Quaid, a citizen of 2084’s “The Colony,” one of two land masses still in existence after a catastrophic war. Every day he travels through the center of the planet to “The United Federation of Britain” where he works, performing manual labor for the members of the upper class. Desperate for something more out of life, Quaid decides to visit Rekall, a company that is able to implant false memories of better times. When the process begins, however, something goes terribly wrong and Quaid finds that the spy fantasy he wants to live out may already be a submerged part of his reality… assuming that he can even figure out what reality is anymore. Kate Beckinsale stars as Quaid’s wife, Lori, who may just be a deadly, deep-cover assassin working for Bryan Cranston’s Chief Administrator Cohaagen. Jessica Biel, meanwhile, plays either a member of the Colony’s resistance or an imaginary love interest created by Quaid’s subconscious. ComingSoon.net sat down with the entire cast to discuss tackling the remake, building the film’s sci-fi world and the tactics of playing for two different fictional realities at once. 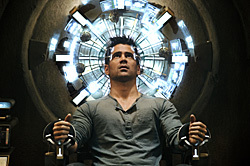 Check out the interviews in the player below and catch Total Recall in theaters August 3rd.